Here are a few more projects we're working on. As I mentioned, we're looking at about 100 new products. So these next few weeks will be very busy with plans, price sheets, and specifications buzzing back and forth between Taiwanese factories and VO world headquarters. As usual I'm probably too optimistic about delivery times, so take take them with the proverbial grain of salt. 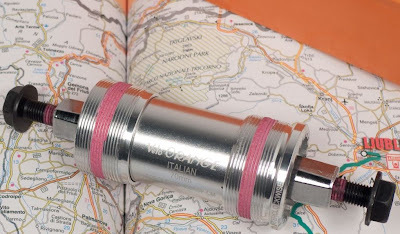 The new VO seat post will use a popular design first developed in Italy, but used by many manufacturers. It'll be less expensive, heavier, and have a less setback than the Grand Cru post. But it will be available in a wide range of sizes. Dia Compe Gran Compe CNC machined long-reach center-pull brakes will soon be here. A matching front mini-rack, ala Mafac, is also on the way. We are looking at VO front derailleurs. Grand Cru road pedals are in the design stage. They will be a bit like the old TA or Mavic quill pedals. We'll have a neat new LED mini dyno headlight and a compact fender-mount tail light, but these are not VO products. Speaking of dynos, several new companies are working on hub dynamos. At least one of the new designs appears to be a "game changer" and might make all those expensive German hub dynamos obsolete. I sure wouldn't buy a top of-the-line hub dynamo until next year. And there's a lot more in the works. We'll have a new thermos bottle that fits in a bottle cage, several new types of bar tape, and, perhaps, a new line of modern bike luggage. We now have Grand Cru bottom brackets in Italian sizes. They are JIS taper so you can use Sugino and most other popular cranksets, including the upcoming VO and Grand Cru models. Here is an article that explains BB threading and selection. Like our other BBs, these have alloy cups, alloy bodies, over sized sealed bearing, and hollow boron axles. 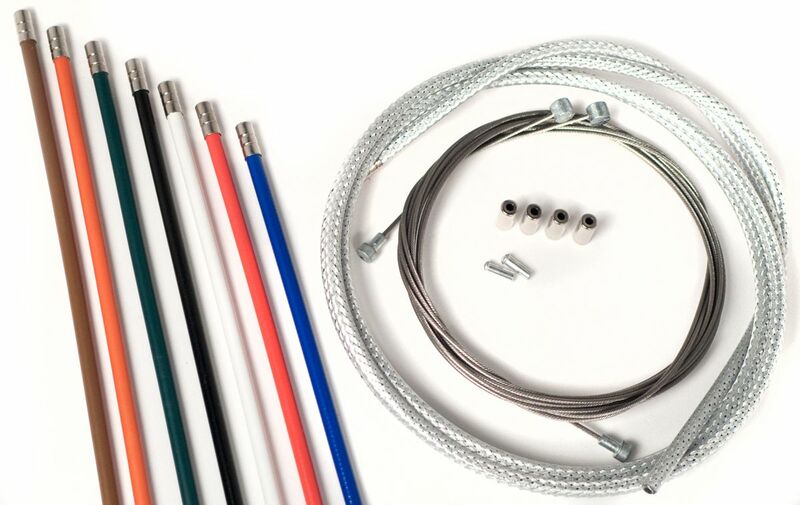 We also have three new colors of cable kits, brown, orange, and dark green. Of course we'll still stock black, white, red, blue, and metallic braid. All colors are available in both shift and brake kits which include cables and ferrules. The new production kits are a little longer; this is a running change in all colors. I'm back from Taiwan with lots to report, enough that I'll split it into two posts. We had an extremely productive trip, dozens of meetings with manufacturers at the show and a plethora of new products. After the show we took the high speed train to central Taiwan and visited 11 factories. The final cold forge tooling for the Grand Cru 50.4bcd crank is now being made and we should have cranks in stock around July. We've made some small changes to the chain rings; they'll incorporate the latest "Shimano-style" tooth profiles, ramps, and pins, making shifting performance far superior to the TA and other classic cranks. We've also decided to develop a similar 110bcd Grand Cru crank. We hope to have them in production in a month or so. The less expensive VO cranks are now in production and should arrive in about 2-3 months. We'll soon have new high flange Maxi-Orange hubs in seven speed freewheel, fixie and cassette versions. The only thing left to do is find the very best Japanese stainless steel sealed bearings to use in them. Or are ceramic bearings worth the extra cost? We may also have new Grand Cru high-low hubs, still working on specs. Again, are ceramic bearing worth an extra $30-$50. A new VO rim is designed and we'll have prototypes soon. It'll be a very high quality medium width triple box section that looks like the old Super Champion but is much stronger. We'll soon have wing nuts for track and road hubs. The Grand Cru titanium rail saddle is ready for production. It's like the ultimate VO model 3 or Brooks B-17. More widths of VO alloy hammered fenders are coming. Should we do 37mm or 55mm first? Three new stems are on the way. 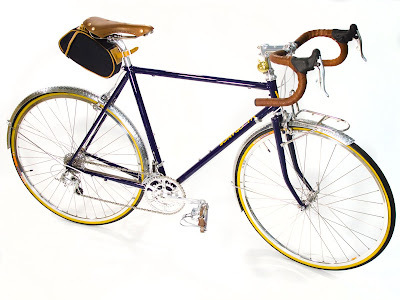 Two inexpensive stainless steel touring racks should arrive in 2-3 months. They are our first Dajia Cycle Works products. Tom and I will be attending the Taipei International Cycle Show next week The following week we'll be visiting factories that make VO parts. I think this trip marks a sort of transition for Velo Orange. 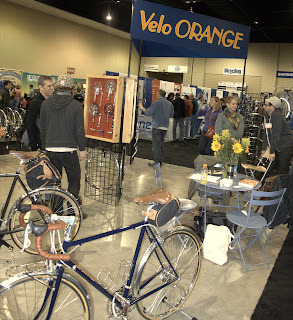 Velo Orange has offered a wide variety of components and accessories that I though were needed by cyclists. Some of these have proven very popular, others have sold only modestly. We are now at the point where we have a rather large crop of successful products. This means that we'll start fewer new projects this year and concentrate more on refining, and promoting our current offerings. And we'll discontinue some items that have not done as well. I feel like we're beginning a transition from start-up mode to long-term operational model. With all this in mind, what other items you'd like to see VO produce? And what products should we look for at the Taipei show? 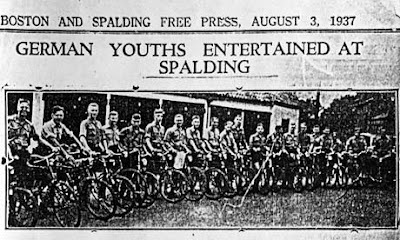 How's this for a headline: "Spyclists: how Hitler Youth's cycling tours caused panic in prewar Britain"? Click through; the article, from today's Guardian is fascinating. And keep an eye out for those dastardly cyclo-tourists! How would you build up your rando frame?